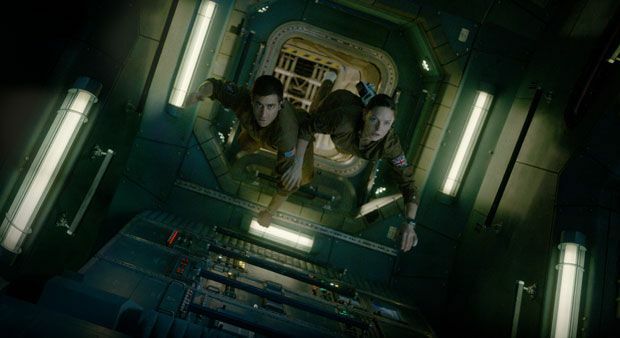 In a crowded marketplace for sci-fi, Daniel Espinosa's Life is at least fortunate to arrive before this year's big-hitters Alien: Covenant and Blade Runner 2049. Consider it the warm-up act then, with a story that feels like a blend / rip-off of Alien and Gravity. Set more or less in the present day, things kick off as a space probe returns from a mission to Mars, docking with the International Space Station. The ISS is manned by a team of six – Jake Gyllenhaal's doctor, Rebecca Ferguson's microbiologist and Ryan Reynolds' engineer among them. On-board the probe is a remarkable discovery: a single-cell organism, the first incontrovertible proof of life beyond our planet. Back on Earth, amid celebration, the Martian is named Calvin. Up in space, the team study its growth – initially into a small translucent creature. After a lab mishap, however, Calvin goes into hibernation; Ariyon Bakare's biologist decides to give it an electrical charge, and that's when the fun really starts. Feeding to survive, the best scene in the film sees the alien grip Bakare's hand, crushing the life out of it. Then it starts to get a little silly – as Calvin bursts its way out of its containment box, the crew starts panicking and Reynolds goes gung-ho with a flamethrower. Rather than ratcheting up the tension with increasing effectiveness, Life ebbs and flows – perhaps because you spend the majority of the duration figuring out who is going to be next to die. Will it be Olga Dihovichnaya's mission commander, or Hiroyuki Sanada's systems engineer? To be fair, Espinosa's sixth feature does end with a neat and impactful twist that subverts the classic hero journey the finale seems set up to be. Although hardly lifeless, it's a film that emulates genre greats while appearing content to exist in their shadow. A Mars mission docks with the ISS bearing a single-celled alien organism, which then bursts out of containment. Derivative sci-fi drama which feels like a blend / rip-off of Alien and Gravity; you spend most of it wondering who’ll die next. Reasonably effective but inessential.